Civil society fears that draft legislation on communications, lawyers and religious practice currently under consideration in Kazakhstan may result in new restrictions on fundamental rights. While an imprisoned journalist and a blogger were recently granted early release on parole, many other individuals remain behind bars because of their free exercise of the rights to freedom of expression and other fundamental freedoms. Calls by UN bodies, human rights organisations and the international community for their release have gone unheeded. These and other developments are covered in more detailed below. International Partnership for Human Rights (IPHR) and Kazakhstan International Bureau for Human Rights and Rule of Law (KIBHR) have prepared this CIVICUS Monitor update on developments concerning freedom of expression, assembly and association in Kazakhstan from September to November 2017 on the basis of KIBHR’s monitoring of the situation in the country. As reported in the previous Monitor update, the government submitted new draft legislation on information and communications issues to the parliament for consideration in September 2017. On 22nd November, the lower house of the parliament approved the draft legislation in the second reading. It is now due to be considered by the upper house of the legislature. The government argues that the new legislation aims to improve regulation in the area of information and communications. However, members of the media are concerned that some provisions threaten freedom of expression and may worsen the environment for journalists to carry out their work in the country. Among others, journalists are required by the new law to verify the accuracy of information through inquiries to relevant bodies prior to its disseminating. The law also increases the time state institutions may take to respond to most media inquiries. Journalists, therefore, fear that this requirement may obstruct the timely publication of information in the public interest. Another proposed provision that has been criticised requires journalists to obtain consent for the publication of information considered to amount to private, commercial or other secrets, without spelling out precisely what this means. Journalists fear that this provision may be used to prevent investigative journalism on corruption-related issues. In earlier updates, KIBHR and IPHR documented a persistent pattern of criminal prosecution and imprisonment of civil society activists, journalists and other outspoken individuals. This pattern continued during the reporting period for this update. Civil society activists Max Bokayev and Talgat Ayanov continue to serve prison sentences handed down last year in retaliation for their role in peaceful protests against land reforms, although the UN Working Group on Arbitrary Detention and other international bodies have called for their release. In late October 2017, more than 250 civil society activists and other civil society representatives signed an appeal demanding that Bokayev urgently be granted access to qualified external medical examinations and treatment because of serious leg pains for which they said he had not received adequate assistance in prison. Prison authorities stated that the activist’s current condition is “satisfactory” and that a doctor has examined him and he is undergoing treatment. They did not provide any further details, though, citing medical confidentiality. Bokayev has other serious health issues, which have made his prison stay particularly difficult. In July 2017, a local Shymkent court convicted trade union leader Larisa Kharkova of abuse of office, sentencing her to four years of restrictions on her freedom of movement, as well as 100 hours of “forced labour” and banned her from holding leading positions in public associations for five years. A criminal case was opened against Kharkova after a court ordered the closure of the Confederation of Independent Trade Unions of Kazakhstan (CITUK) led by her in January this year. On 29th September, a regional court upheld the sentence against the activist. Prior to the appeal hearing, the former press service of the CITUK distributed a press release, voicing concern about two incidents it believes may constitute attempts to put further pressure on Kharkova and other individuals associated with the association. In one of these incidents, on 12th September a car owned by Kharkova’s son, Vladimir, caught fire outside his grandmother’s house in Shymkent. A fire brigade had to put out the fire. Police opened an investigation into the incident, but it is not known to have had made any progress. Also on 12th September, the CITUK’s former press secretary Lyudmila Ekzarkhova discovered an unknown device that looked like an explosive at the bottom of her car in Almaty. Police, firefighters and emergency services were called to the location. After an hour, police concluded that the device did not constitute an explosive and removed it, without showing it to Ekzarkhova. Two other trade union leaders, Nurbek Kushakbayev and Amin Yeleusinov, were imprisoned earlier this year because of their involvement in a peaceful workers’ strike to protest the court decision to close down the CITUK. On 16th November 2017, a local court in the city of Kapchagay ruled in favour of a request for early release on parole submitted by Chair of the Union of Journalists and National Press Club, Seytkazy Matayev. In accordance with this decision, he will be released, unless the prosecutor appeals the decision. Matayev and his son Asset Matayev, director of the private KazTAG News Agency, were convicted of tax evasion (the former) and fraud (both) relating to the use of state funds and sentenced to six and five years in prison, respectively. They were also banned from holding leading public or business positions for ten years. Both national and international media watchdogs have denounced the charges against the two journalists. Matayev’s health has deteriorated in detention and he has complained about not being granted adequate medical assistance for his health problems, including high blood pressure, as well as kidney and brain issues. In another case, blogger Ermek Taychibekov was granted early release on parole in October 2017. Taychibekov was convicted of “inciting national discord” and sentenced to four years in prison in December 2015 because of social media posts where he argued in favour of Kazakhstan joining Russia. 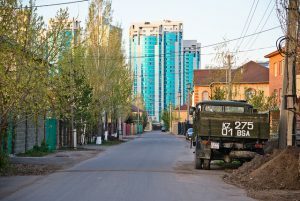 International human rights bodies have repeatedly criticised the vaguely-worded criminal code provision on “inciting” national and other discord, under which he was found guilty, as contrary to Kazakhstan’s international obligations on freedom of expression and other fundamental rights. Several other bloggers, civil society activists and religious believers remain in prison on charges of “inciting” discord. Independent journalist, blogger and civil society activist Zhanara Akhmetova (also known as Zhanar Akhmet), who fled Kazakhstan in March 2017, was detained in Kyiv on 21st October on an arrest warrant issued by the Kazakhstani authorities through Interpol. On 2nd November, a local court sanctioned her detention for 60 days but on 22nd November, she was released on bail pending a decision on the extradition request. The basis for the extradition request is a previous conviction of Akhmetova on fraud related to real estate deals, for which she was sentenced to seven years in prison. In 2010 her sentence was, however, suspended until 2021, when her son turns 14. Her lawyer has argued that she was unlawfully declared “wanted” since the suspension had already gained legal force and the Kazakhstani authorities have had not initiated any new criminal case. There are also reasons to believe that the extradition request is politically motivated. Before she left Kazakhstan earlier this year, Akhmetova was subjected to intimidation and harassment for her writing and civic activities, including articles for the opposition-oriented Tribuna-Sajasi kalam newspaper, social media posts critical of the government and involvement in peaceful protests against government policies. In early 2017, she was twice convicted of administrative offenses because of her involvement in peaceful protests and a third administrative case on jaywalking was opened against her on the basis of a supposed complaint from a citizen. She also told RFE/RL that she had been warned that she could face new criminal charges because of her writings on people threatening to engage in self-immolation to protest injustice. Shortly before Akhmetova’s detention, her application for asylum in Ukraine was rejected, a decision she announced she would appeal. In the city of Uralsk in northwestern Kazakhstan, local authorities sought to prevent a parents’ gathering on 4th November 2017 to discuss new Russian language textbooks, which have been seriously criticised for their content, and to elaborate recommendations to the Ministry of Education on this issue. A parents’ initiative group had arranged to rent a room in a centrally located hotel for the meeting, but shortly before the meeting was to start, administrators told them that they could not hold it there because of “technical problems”. The initiative group then agreed with the Uralskaya Nedelya newspaper to relocate the meeting to its office and rented a bus to take participants there. However, as soon as the bus arrived at the hotel, police stopped it and detained the driver because the bus allegedly was not “technically fit” for use. Moreover, one of the members of the initiative group, lawyer Shakir Suhanberdin, was summoned by police and told that a criminal case on “inciting social discord” had been opened on the basis of a complaint from a number of school directors and other parents relating to his criticism of the new textbooks. Police informed him that he is currently treated as a “witness” rather than as a “suspect” in the case. The parents’ meeting eventually took place at the Uralskay Nedelya office, with police patrolling outside. Police have also reportedly summoned social media users who have criticised the new textbooks for questioning in at least Almaty and Astana. The Ministry of Justice of Kazakhstan has elaborated a draft Law on the Activities of Lawyers and Legal Assistance, which is expected to be submitted to the parliament by the end of the year. This law risks undermining the independence of the legal profession in the country. The country’s legal community has expressed serious concerns that the draft law will increase regulation and control of the legal profession, interfere with its self-regulation, and encroach on the status of lawyers in violation of international standards. Among the most problematic proposals are provisions that would allow for the establishment of a state advokatura, the inclusion of government officials and retired judges in disciplinary commissions and the emergence of a form of parallel advokatura in the form of legal consultants. Representatives of the lawyers’ community were not consulted or invited to participate in the elaboration of the draft law. Further reinforcing concerns, lawyers have increasingly been subjected to pressure and undue interference into their work by law enforcement and judicial authorities. In response to this development, the Republican Bar Association has established a special committee to protect the rights of lawyers. As reported in the previous update, draft legislation currently under consideration would introduce new restrictions on religious practice and religious communities, in addition to those already set out by the 2011 Law on Religious Activity and Religious Associations. At the beginning of October 2017, Kazakhstan’s Religion and Civil Society Ministry published a revised version of the draft legislation that introduces amendments to the 2011 law, the Administrative Code and a number of other laws. Despite some minor improvements compared to the first version of the draft legislation, the revised version also sets out a range of problematic provisions in violation of Kazakhstan’s international obligations. Among others, as highlighted by Forum 18, the draft amendments would provide for additional restrictions on sharing beliefs and religious teaching without state permission; strengthen state control over religious communities; and increase fines for violations related to basic religious activities. After the draft legislation has been reviewed by various government agencies, it will be submitted to the parliament for consideration. Among the minority religious communities subjected to harassment inKazakhstan are the Jehovah’s Witnesses. In an opinion made public in October 2017, the UN Working Group on Arbitrary Detention concluded that the deprivation of liberty of Jehovah’s Witness Teymur Akhmedov is arbitrary and that he should be immediately released and granted compensation. As we have reported before, Akhmedov was convicted of “inciting religious discord” and sentenced to five years in prison in May 2017 because of his discussions on religious issues with a group of young people. These people pretended to be students but had apparently been engaged by security services to infiltrate the discussions. The UN Working Group found that Ahmedov was arrested solely for the peaceful exercise of his right to freedom of religion and that he was the victim of discrimination on the basis of religion. Currently he remains in prison. Another Jehovah’s Witness, Dmitry Bukin, who heads the Jehovah’s Witness community in Astana, went on trial in October 2017 on charges of storing literature containing signs of incitement to religious hatred, an administrative offence. During a search of the facilities of his community that was carried out in January as part of the investigation against Akhmedov, police confiscated more than a dozen religious books, with titles such as – “What does the Bible really teach us”, “Humankind in search of God”, “Should we believe in Trinity?”. An expert commissioned by the prosecution concluded that these books contain signs of “propaganda of the incitement of religious hatred”, as well as “propaganda of the superiority of Jehovah’s Witnesses”. In a welcome development, the Astana court reviewing the case ruled to close it on 17th October 2017.